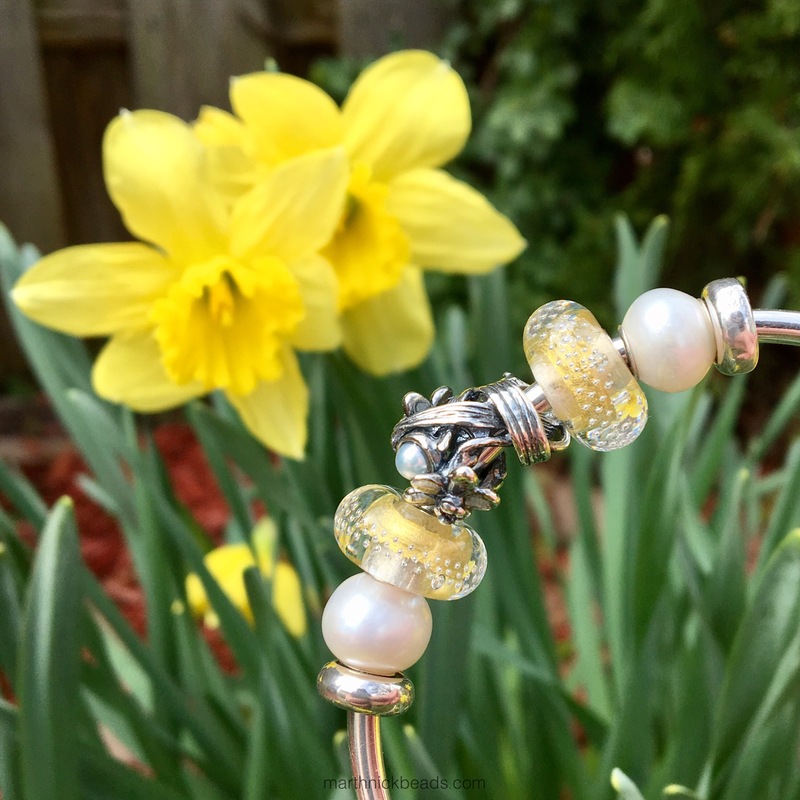 Finally my daffodils bloomed so I could bring out the Trollbeads (affiliate link) Daffodil of March for some photos! I didn’t have any of the Flowers of the Month but thought maybe I could start to collect a few. Sometimes on Instagram I see a British lady (@evepink123) who often wears one or more on a bangle and it always looks so elegant. This one is truly a small piece of art and epitomizes what I love about Trollbeads silver pieces. The lines are so fluid and each side looks different. Check out the details. There is a freshwater pearl on it, too. It costs $56 USD/ $64 CAN. 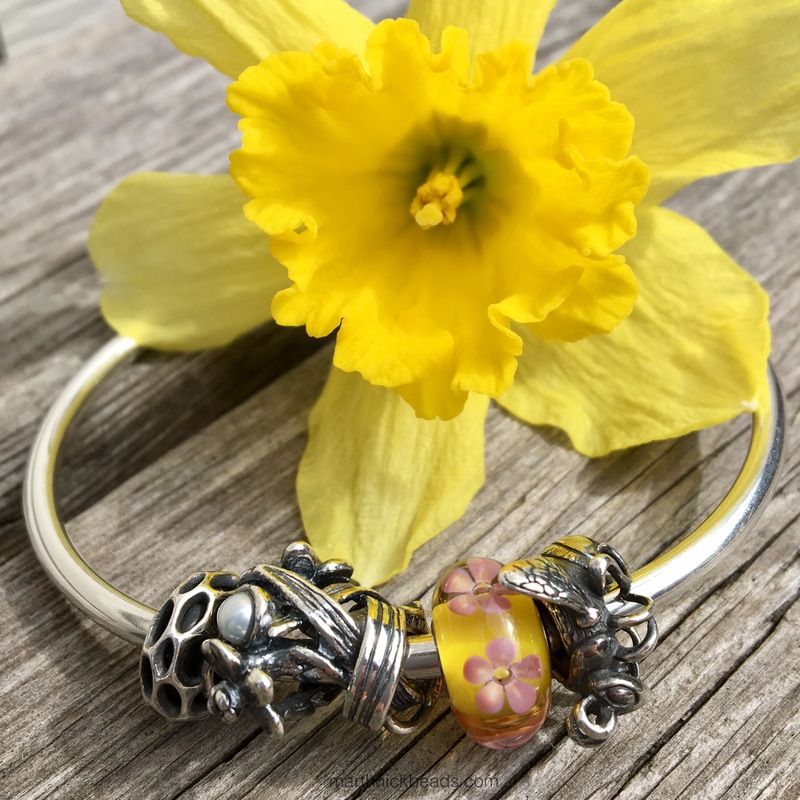 My favourite yellow Trollbeads are the Gold Silver Trace ones. On this bangle I’ve used my bright yellow and pink Unique with the Bumble Bee and Beehive Spacers. For a combo that doesn’t use yellow, I thought I’d try the Pink Prisms and a Feldspar Moonstone. I sure like the bangle with three Water Lily Spacers on it. Next up is my favourite combo. I wore this on Monday of this week. I love the Amber Violets so much! The yellow is so buttery looking and the flowers are a beautiful swirl of purple and indigo. In the middle of the bottom part of the bracelet is a Moonlight Bubbles that doesn’t look like the stock image. The Honey Dawn below it looks simply luscious! The top left bead is called Lavender Stripe and is very pretty. We had to go to Home Depot on the weekend and under that lighting the Lavender Stripe looked a pale blue! Lastly, I made a full bracelet, bringing together some soft greens, pinks and purples. This uses the entire Mysterious Ways Kit. This picture below is really advertisey looking! The photo above uses a page of the Trollbeads catalogue that I have and below the bracelet is on the back cover. Some of the Japanese Instagrammers use it for their photos and I always wondered what they were using. Now I know! 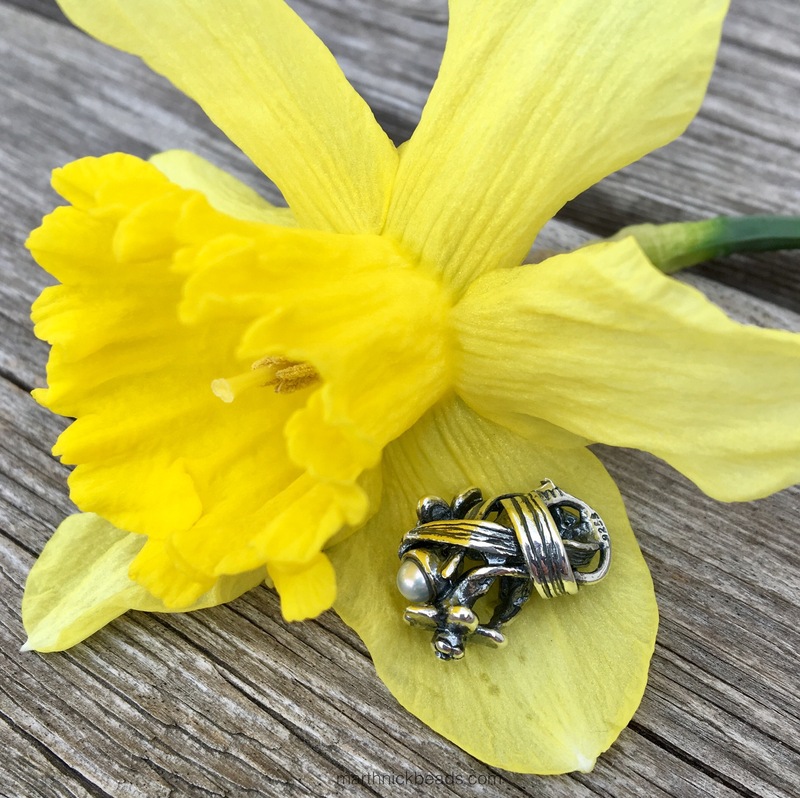 The Daffodil of March and all the Flowers of the Month have been around since the fall of 2013 and it’s amazing what a rich back catalogue Trollbeads has. One could easily keep purchasing older beads and never get bored. Do let me know which Flowers of the Month you have or which ones you’d like! There are some lovely photos showing them all here, at Enchanting Trolls. Have a great weekend everyone! By the way, tomorrow there should be another blog post on The Trollbeads Blog, where I made up some more combos using the Feel Good Bracelet. Your combinations are beautiful! 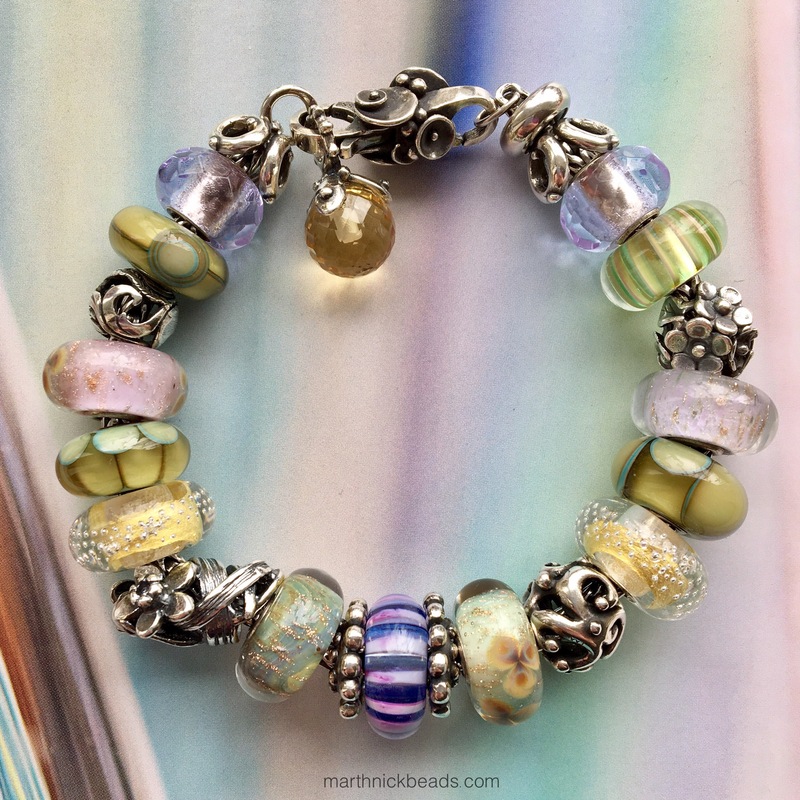 I especially like the full bracelet – it looks like a watercolor painting. 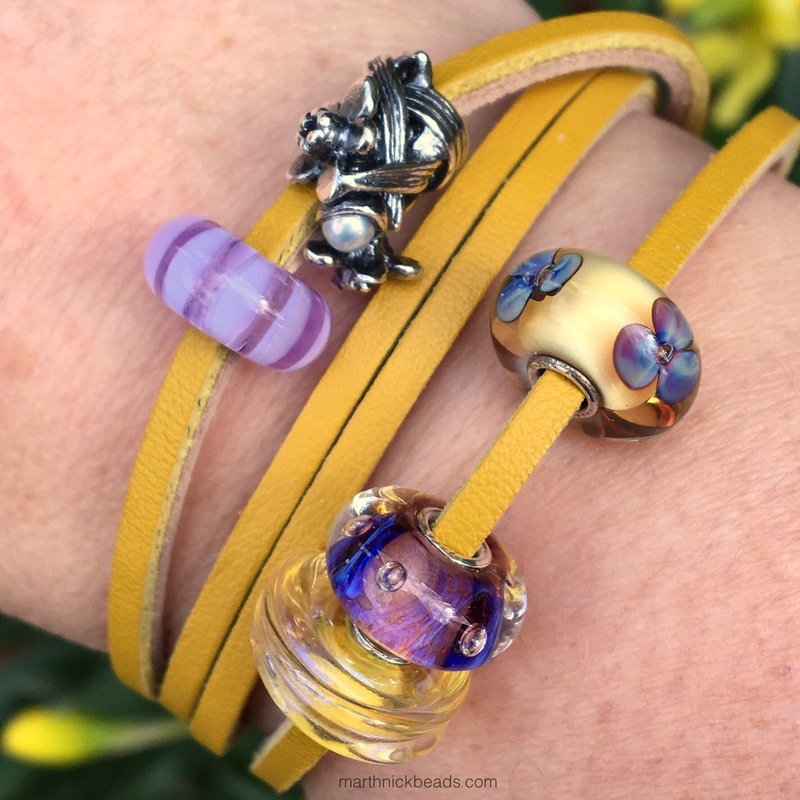 What I love so much about Trollbeads is how you can put together unexpected color combos and end up with such a painterly effect. I started collecting a few of these flowers, too. My favorite is the bindweed. The daffodil is next on the list – it is so pretty how the leaves weave around the bead. Thanks Elise! Yes, I love the soft colours of Trollbeads, too! This summer I think I’ll try to pick up the Balance of Nature set in NYC, as it would be a good one for choosing in person, I think. I shall have to look up the bindweed. My friend Trisha recently bought the daisy and I saw it in real life Monday-so pretty! So pretty Martha! 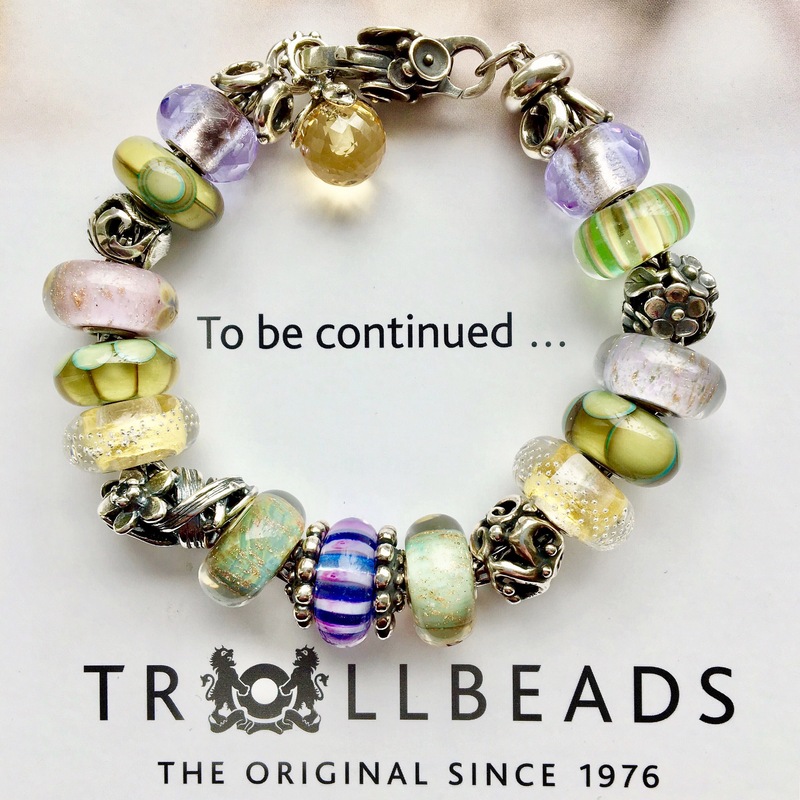 I agree that the Trollbeads catalog can keep newer collectors like me happy for so long just collecting these amazing “mature” beads (we don’t say old;). I am awaiting the Chrysanthemum from the Perlen campaign and currently have the Rose of June which is by far one of my favorite silvers. I thought I scored big on a pre-loved EBay set a few months back (well-you know how that turned out;) The daffodils were up there with my favorite from this collection, and I hope to own them all some day. You are right, these beads are so sculptural, and so unabashedly feminine-I absolutely love them and how you’ve paired them. Hi Martha, I always love getting your posts. All of your combinations are just so beautiful. I would pick the Violet of February as my favorite of the Flower of the Month beads. Not because it’s my birthday, I just love violets. I really, really need to get that Amber Violet. My wishlist is unending! When I first started collecting I got a couple of retired Pandora pieces from eBay. The manager at the Pandora store I go to confirmed that they were real, but said it wasn’t really a good idea to do it. I like a lot of the retired Trollbeads and Pandora charms, but if I can’t find it at an authorized dealer I don’t get it. Now I look to Perlen for older items. I’m too nervous to buy from an unauthorized dealer also. It’s good the ones you got were real though! I will go look at the violets bead. I don’t buy according to my birth month ever, just go with what appeals to me but my friend is going to buy the birth months for her family. So many different ways to go! Like your full bracelet. I only have June Rose is my birthday month. Thanks Michele. The rose looks lovely and is on my list! Hi Martha, I just wanted to tell you that I love your bracelet on Instagram with the pansies in the background. True Beadz Almost Amethyst is going to the top of my wishlist. That bead is gorgeous!!! I cannot get enough of the purple and yellow combination now (thanks to you!) I have to get beads in these colors so I can do that. I’m sorry, but I have no idea how to make comments on Instagram so I have to do it here. Hi Suzanne! No worries, you can comment wherever you like! Yes, I love the deep purple of that bead also and it matches my pansies perfectly! I’ve actually never bought a pot of pansies before, but really wanted one this year for that hit of colour. Very pretty Martha! Some of the first Trollbeads I purchased were Rose of June and Narcissus of December and I still wear them so often. The pearls are a really nice touch. I also have the Chrysanthemum which I bought when Perlen had a bundle of leather bracelet, flower lock, and Flower of choice that was too good a deal to pass up! I saw Perlen has a bundle deal now where you get Flower of choice, Lock of choice (pick from selection), and bracelet chain, I think it works out that you basically pay regular price for the Flower and Lock but get a chain free (plus VAT deduction). So good deal but I resisted since I didn’t really need/want the items in the offer. Hi Natalie! Yes, I know the deal you are talking about, but like you, I don’t need another chain or lock at this point, really. The Chrysanthemum and Narcissus are the next two on my list! I highly recommend both those! ❤ they are a good size, I know some of the others are smaller. Oh yes, aren’t we both Nov. 30? We need to get the Chrysanthemum before then and then we can be beadsisters on that day! Some really wonderful combinations, especially the full bracelet. Like you I’ve just bought the birth month flowers that I like so have Rose of June and Calendula of October. Chrysanthemum of November is next on my list! Wonderful! Sounds like the Chrysanthemum is popular! 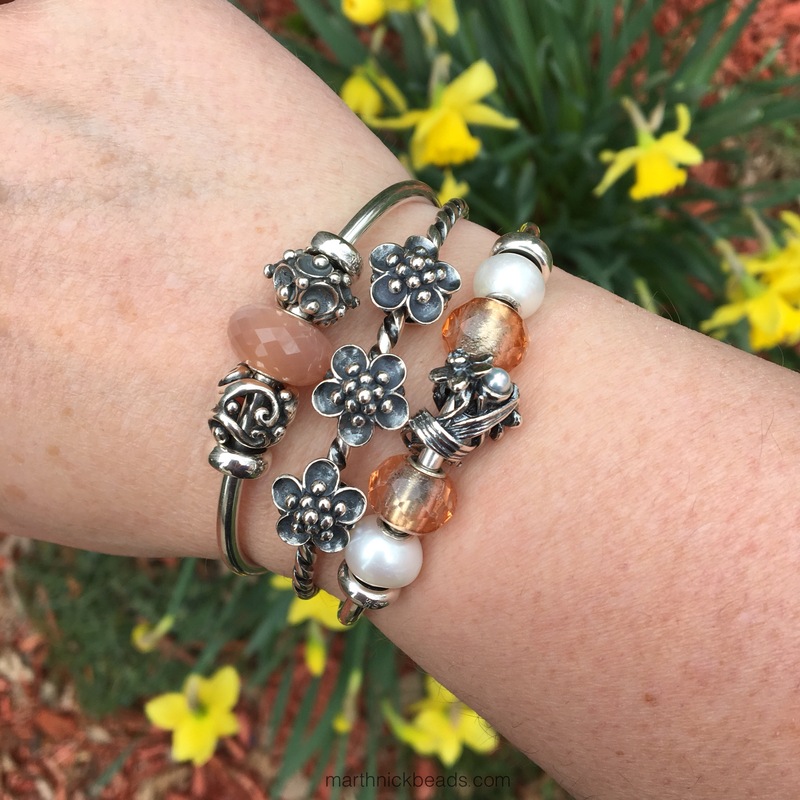 I love florals and the pearl tucked into each one of the artistically detailed Flower of the Month beads. Due to a bead sale with favorable pricing I have most of them, but find some are harder to style with than others. 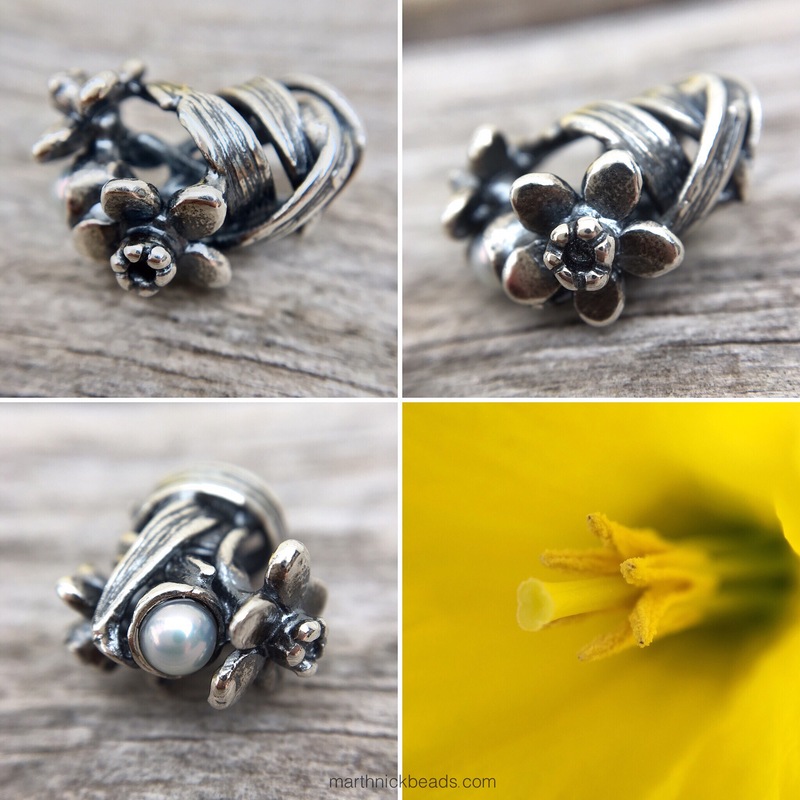 The Daffodil is one of the challenging beads in the collection for me so I was happy to see you feature it in your blog! 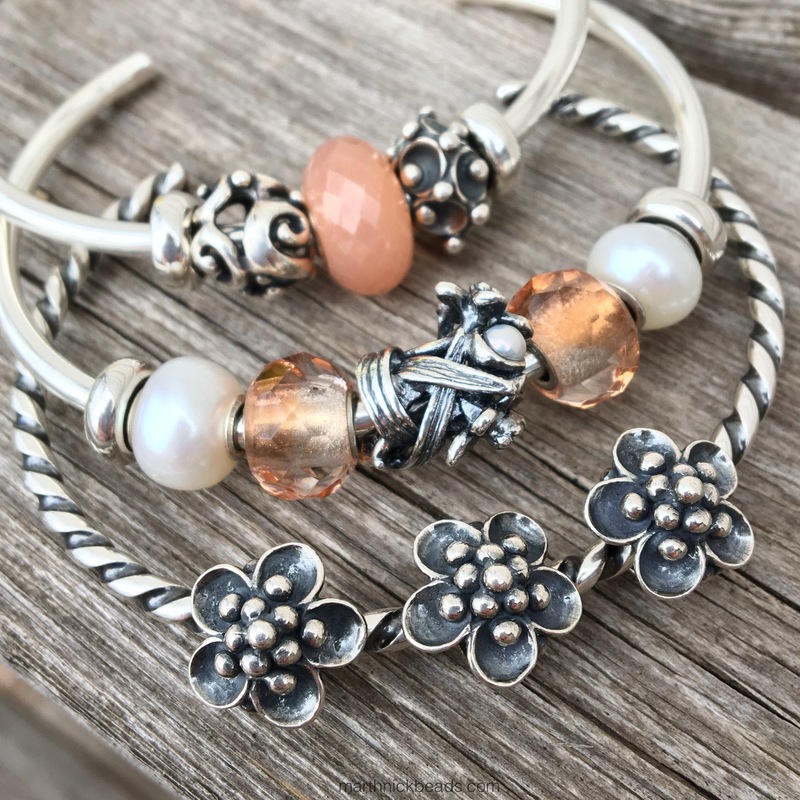 The full bracelet you designed is beautiful with the softly muted Spring colors! Thanks, Martha! How wonderful that you have most of them! I didn’t realize they were so exquisite before seeing the Daffodil in real life. My list continues to grow!